See Saturn, Jupiter, Venus and Mercury on the night sky this Fourth of July. This map by the SkySafari app shows where each of the planets will be visible from New York City at 9:30 p.m. local time on July 4, 2018. While you're waiting to watch fireworks this Fourth of July, take a look up at the sky to spot Venus and other bright planets. Venus will rise Wednesday morning (July 4) just before 9 a.m. and set around 11 p.m. local time, making the "evening star" visible before, during and after most big firework shows happening around the country. Look for the orange-colored planet near the western horizon in the evening. It will be situated in the constellation Leo, the Lion. This Fourth of July, look for Mercury just after sunset. To find this tiny, faint planet, trace an imaginary line between the bright “evening star” Venus and the sun’s location below the horizon. Mercury will appear close to the middle of that line. Jupiter will also shine bright in the sky all evening, rising around 3:30 p.m. and setting by 2 a.m. local time on Thursday (July 5). The planet is currently in the constellation Libra, and it will reach the meridian, or its highest point in the night sky, at approximately 9 p.m. If you look through a small telescope, you may even be able to spot its four Galilean moons. 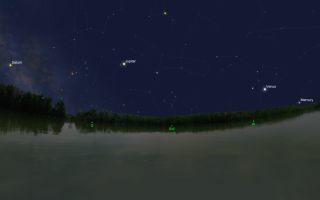 Saturn will rise in the constellation Sagittarius a few hours after Jupiter, just before 8 p.m., and the planet will be at its highest point in the sky just after midnight. To find out exactly when and where the planets will be visible from your location, check out these handy calculators at timeanddate.com or heavens-above.com.